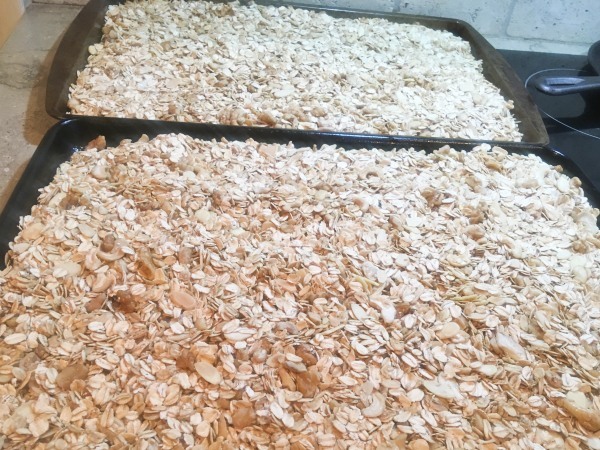 One Hot Stove: The House Granola Recipe, and Hanging with Kitties! The House Granola Recipe, and Hanging with Kitties! Open my kitchen pantry, and the first thing you will see is an over-sized jar of granola. Every couple of weeks it gets replenished and every morning, all year round, my husband eats a big bowl of granola for breakfast. This has been going on for years. So here it is, the house granola recipe that I have made a hundred times. The house granola recipe has in fact evolved over time. In fact I've posted a standardized granola recipe a decade ago, and now I chuckle that that recipe used 3 cups of oats. These days, I go big and make a huge batch that fills 2 sheet pans to the brim- having said that, you could certainly scale this recipe down. Granola is inherently a calorie dense food, but nutritious and satisfying with whole oats, seeds and nuts. This granola has a little oil and a little sweetener, just enough to make it toasty and golden and give it a touch of sweetness. Dried fruits add another sweet-tart pop. This recipe makes a "loose granola". If you prefer clumpy granola, there are other recipes that would work better- they often include egg whites and/or sweet syrups for clumping. 1. Lightly oil (I use spray) two sheet pans (about 18x13 inches). 2. Preheat the oven to 300F. If your oven has a convection setting, use it. It will reduce cooking time. 14 cups old-fashioned oats. This is almost a whole big canister of oats. I use all but one cup of oats from the big canister. The one cup is saved as an ingredient for other recipes where I use oats, like smoothies and pancakes. 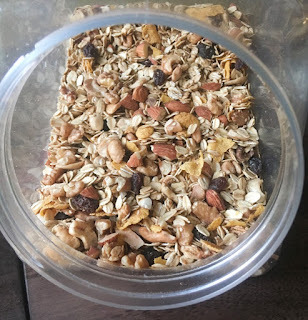 Packaged nut pieces are often cheaper than whole nuts, so they are a good option for granola, particularly since you won't need to chop them either. Use any of your favorite nuts and seeds here. 4. After stirring all ingredients together, spread them in an even layer on the two prepared sheet pans. Switch pans top rack to bottom rack, and turn left to right. Continue baking for 15-20 minutes. Turn off the oven and let the pans sit in the oven for 10-15 more minutes. Let them cool completely on baking racks. No need to stir the granola at any point until it is completely cooled. 6. At this point, add a handful of dried fruit such as raisins/ cranberries/ dried cherries to the granola. I sometimes put in a handful of cereal (e.g. cheerios or cornflakes) for added crunch. Toss everything together and store in an airtight container. Enjoy with milk (dairy or non-dairy), or yogurt and fresh fruit. The best thing that happened in 2019: In the very first week of this year, my 7 year old and I drove to the local animal shelter one cold Sunday morning for a volunteer orientation. We walked out an hour later as official shelter volunteers- allowed to go the shelter whenever we please and volunteer with the cats and dogs. I have wanted to do this for a couple of years but hesitated. There was a new baby in our family, I wanted my daughter to grow up a little more before taking her to volunteer. But really, a big reason holding me back was that I was afraid that going to the animal shelter would be depressing. I am glad I got over myself and decided to give it a shot. Our shelter in fact is a very cheerful and welcoming place. The staff is friendly and there are always volunteers and prospective families milling around. The animal housing is clean and there are plenty of treats and toys available. Kiddo and I go for a couple of hours almost every weekend. We stop by the puppy and small dog room, and then spend most of our time with the cats. Our chosen job is cat socialization, so we choose a cat and take it from its cage and into an interaction room, where there is space to play and cuddle with the cat. We do this with as many cats as we can. It is amazing to see the different personalities of the cats- there are shy ones and cuddly ones, some purr like engines, others are singularly focused on climbing everything they can. Some play fetch like dogs. They are hopelessly funny and cute. Watching my child tenderly play with the cats is the sweetest thing and I know that it enriches her life as much as a music or sports lesson would, and certainly way more than screen time or random toys would. Animal shelters are places where you get to see some of the horrible things that humans do- neglecting, abusing and abandoning pets who live at their mercy, but you also get to see the best side of humanity. I met an older couple who volunteer every single day with the cats. They took it upon themselves to buy really chic, comfortable cat beds for every cage. Shelter life is stressful for animals and creature comforts and human love go a long way in making their lives better. Please consider visiting your local animal shelter and helping out when you can. I am amazed at how easy it was to fit this volunteer gig into my pretty-well-packed life. We go while baby brother is napping, and get groceries on the way back. Hanging out with shelter cats is our mother-daughter quality time and I hope we can keep doing this for a long time. April is just around the corner. As the weather is warming ever so slightly and the daffodils and tulips are popping up from the ground, I am ready to step out of my comfortable winter kitchen rut (and blogging rut, let's be honest) and try some new recipes. My kitchen theme for April is big salads and bowls- recipes with raw and cooked vegetables and saucy dressings, and hearty enough to eat as a meal. Those are already my favorite things to eat- like this dumpling salad and this tofu/paneer tikka salad, and there are many more ideas out there. I have salad and bowl recipes pinned and bookmarked and torn out of magazines and waiting patiently in cookbooks. Maybe I'll make some of them this month. Join me if you like and try some new recipes for big salads and bowls in your own kitchen. If you do, send me an e-mail at onehotstove at gmail DOT com with a description and picture, and I'll feature it on this blog! Great to see you back in action in the blogosphere! Adding the granola recipe to my long list of must-try recipes. Looking forward to the salad recipes. 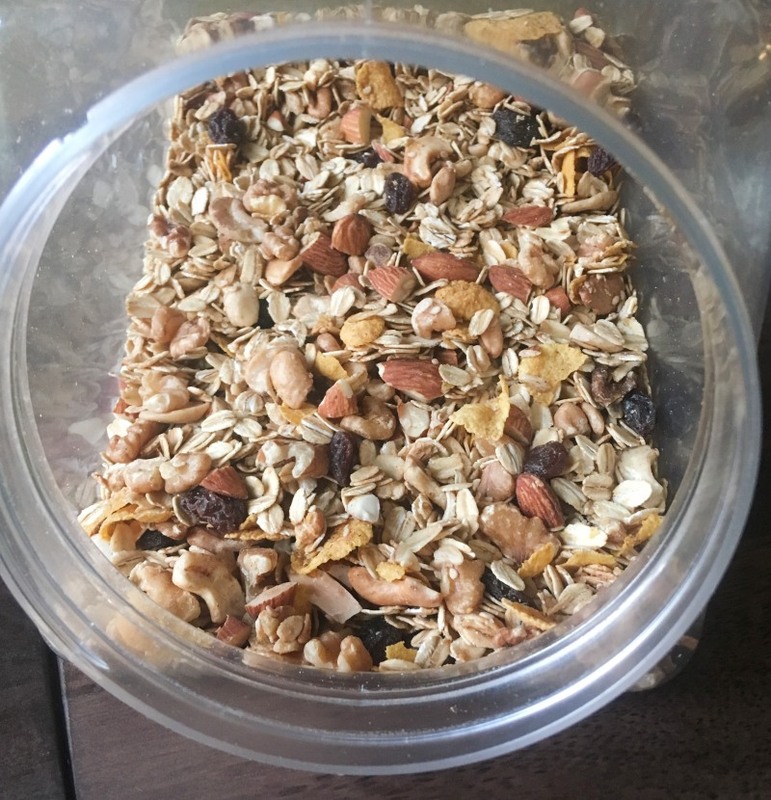 Home made granola is great - I love how it keeps ingredients fresh because of the turnover as well as tasting good. Your shelter volunteering is inspirational. We got our cat from a shelter and I don't think I could volunteer there - was just a bit much for me and I was glad to leave. And good luck with your salads - would love to see what you do but am not in such a salad meal as it is cooling here for autumn. Johanna- Yes, I suspect you'll be eating warm, hearty meals while we in the Northern hemisphere transition to lighter summer fare. Shelters can indeed be hard to visit, but somehow ours is pleasant and I feel good about visiting the animals even if I can't adopt them all. Welcome back Nupur. I've missed your posts. I am looking forward to your salad bowl ideas for the warmer months. What you are doing with Lila is awesome. Learning empathy and kindness is very important in the world we live in today. It will certainly help them keep things in perspective when they are older. SN- Thanks! I miss posting regularly. The blog keeps me trying new recipes, so fingers crossed I keep it up. 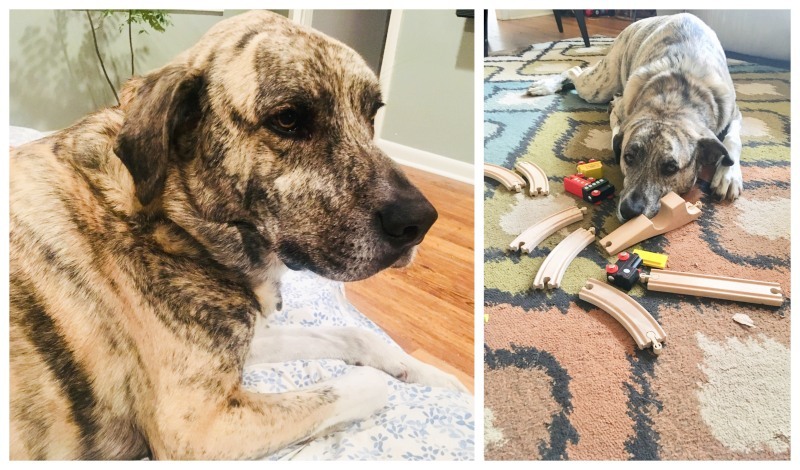 Lila's always enthusiastic about going to the shelter and has become a nice weekend tradition for us. Always up for new salad/bowl recipes, and I am so happy that you're back to blogging. I was just sitting down one evening last week thinking about the years that went by, and I thought of you and all the cooking we did "together" in the blogosphere. I read through some posts, left a congratulatory message for you on becoming parents for the second time. I can't see the comment now. So nice to come back and read your posts. I want to find the time to resume blogging as well. It was extremely therapeutic. We've been blessed with our second child as well. And life's chugging along! Raaga- I miss reading your blog and do hope you resume it! Yes, I do miss the heyday of blogging too :) Sometimes comments seem to vanish in cyberspace but I am glad this one made it through. Many congrats on your second baby and I am so glad you are doing well! I made your granola recipe almost a decade ago and loved it! This new post inspires to me start again. Good to see you back. So fun playing with kitties! Try this one, Sangeetha- it is the result of decades of trials ;) Thanks for coming back and reading my posts! It's nice to see that you're blogging again. A cat cafe recently opened up in Chapel Hill, and my co-workers and I are planning to visit soon. The cafe uses its profits to care for the cats and facilitate adoptions. I'm looking at the mug rug you made as I type. I use it every work day and think of you. Hi Anne! You are so sweet- please accept a long distance hug! I've heard of cat cafes but never been to one. What a great idea for cats that need adoption and very therapeutic for humans. Dear Vaishali- You post so regularly and I remain a constant reader. 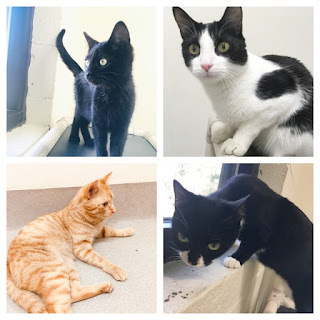 The shelter kitties are just darling, we love being able to spend time with them. Hi Nupur, I had posed a comment a few days ago. Maybe a glitch, so here’s I am again. I’ve tried a couple of granola recipes before, but they were a flop. I want to give it another try, hopefully I will get it right. My son and I are dog lovers and we go to the local humane society and play with and walk dogs. It’s is so satisfying. I wish we had a dog... one day!! We do salads, not as frequently as we’d like and I need to make it a habit. Come summer, It’ll be easier. Hi Pallavi! What happened to your previous granola attempts? Not tasty, or burned, or something else? Try this one, but maybe scale it down. You guys are awesome to go and help with dogs at the humane society! It is indeed a win-win for animals and humans to do that. I do hope you get to bring a dog home someday. (Lila and I too would love to adopt a cat someday but for now can't add another pet, so the shelter work satisfies).